Much has been made of the fresh ideas, revolutionary approaches and film-school-grad fervor – in short, the youth – of filmmakers at the vanguard of the 1970s New Hollywood era. Indeed, when Michael Pye and Lynda Myles wrote their contemporaneous account of the New Hollywood era, they chose as their title The Movie Brats – a then-trendy term used to describe auteurs such as, among others, Francis Ford Coppola, George Lucas, Brian De Palma and Steven Spielberg, all representing “the first film school graduates and movie buffs to gain real power in the industry” during the 1960s and ‘70s. But while it is undeniable that film brats prospered throughout the New Hollywood era – the first period in Hollywood history when significant numbers of movies were made by people who learned their craft through academic study of other movies – stage-trained directors, TV-trained craftsmen (including several with roots in live dramas of the 1950s) and sundry other grizzled veterans also enjoyed a heyday, and many were inspired to do some of their best work during the 1970s. Chief among the relative graybeards who made impressive additions to their resumes even as the younger bucks grabbed most of the press coverage: Sam Peckinaph, who was 46 when his Straw Dogs (1971) was released; Robert Altman, already 50 when his Nashville (1975) premiered; Don Siegel, who unleashed Dirty Harry (1971) when he was 59; and John Huston, who delivered Fat City (1972) at age 66, and The Man Who Would Be King (1975) at 69. Sidney Lumet was 49 when he started shooting Serpico , his street-smart, documentary-style drama based on the real-life story of New York police detective Frank Serpico, in July 1973. By that time, he already had to his credit 18 feature films – including the classic courtroom melodrama 12 Angry Men (1957), the Cold War thriller Fail Safe (1964), the taboo-shattering The Pawnbroker (1965)  and the high-tech caper The Anderson Tapes (1971) – and many acclaimed television dramas, including a live-broadcast version of Eugene O’Neill’s The Iceman Cometh, starring Jason Robards and featuring a young Robert Redford. To put this resume in context: In 1957, when Lumet directed 12 Angry Men, his debut feature, at age 33, Roman Polanski was a 24-year-old student at the Lodz Film School, Francis Ford Coppola was an 18-year-old drama major at Hofstra University – and Steven Spielberg was 11 years old. [I]n the late fifties, walking the Champs Elysees, I saw in neon a sign over a theater: Douze Hommes en Colere – un Film de Sidney Lumet. 12 Angry Men was now in its second year. Fortunately for my psyche and my career, I’ve never believed it was un Film de Sidney Lumet. Don’t get me wrong. This isn’t false modesty. I’m the guy who says “Print,” and that’s what determines what goes up on that screen… But how much in charge am I? Is the movie un Film de Sidney Lumet? I’m dependent on weather, budget, what the leading lady had for breakfast, who the leading man is in love with. I’m dependent on the talents and idiosyncrasies, the moods and egos, the politics and personalities, of more than a hundred different people. And that’s just in the making of the movie. At this point, I won’t even begin to discuss the studio, financing, distribution, marketing, and so on. While working at that breakneck pace, surmounting daunting logistical problems on a daily basis, Lumet somehow managed to make a movie that, decades later, remains among the enduringly influential  and highly regarded New Hollywood films released by Paramount during the Robert Evans regime. And in doing so, he captured and reflected the zeitgeist of a turbulent time as vividly as any movie released by any studio during the ‘70s. The concluding scenes pointedly refrain from giving the audience the emotional balm of an uplifting sense of triumph. In fact, the final scene announces that a bitter and disillusioned Frank Serpico left the police force and moved to Switzerland on June 15, 1972. By dramatizing Frank Serpico’s story in such a manner, as a tale of corruption so intense and conspiracies so vast as to seem almost beyond the ability of just and honorable men to comprehend, confront and combat, Lumet and his screenwriters tapped into the worst suspicions and darkest assumptions of a moviegoing public battered on an almost daily basis by revelations and reverberations stemming from the ongoing Watergate scandal. 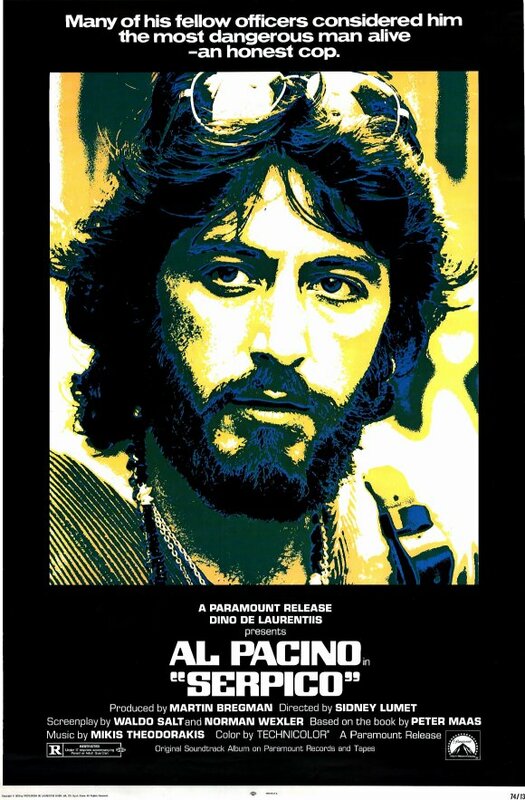 Serpico had its premiere in New York on Dec. 5, 1973, scarcely five weeks after a besieged President Richard Nixon, desperate to reverse his plummeting poll numbers, ordered the firing of special prosecutor Archibald Cox during the infamous “Saturday Night Massacre,” two weeks after President Nixon felt compelled to inform an assemblage of 400 Associated Press managing editors that he was “not a crook”  – and one day before White House chief of staff Alexander Haig testified in federal court that maybe, just maybe, some “sinister force” was responsible for the 18 ¼-minute gap in a subpoenaed tape of Oval Office conversations. Serpico arrived at a time – during the revelations of Watergate and the winding down of Vietnam, in the wake of a decade rocked by assassinations, scandals and civil unrest -- when American moviegoers seemed atypically willing to accept, even embrace, movies with endings that were at best ambiguous -- and at worst, bleakly downbeat. The Pawnbroker (1965), a harrowing drama about a Holocaust survivor (Rod Steiger) who continues to be haunted by memories of his death camp experiences even after relocating to New York, very nearly was denied a Production Code seal because of a scene in which a prostitute fleetingly bares her breasts to the title character in the hope of obtaining money for her desperate boyfriend. A period during which Lumet also enjoyed critical and commercial success with Murder on the Orient Express (1974, Dog Day Afternoon (1975) and Network (1976). Lumet would take a similar approach to rendering the morally tarnished police-officer protagonists of Prince of the City (1981) and Q&A (1990). Christopher Orr of The New Republic, Stephen Hunter of The Washington Post and Owen Gleiberman of Entertainment Weekly are just three of the critics who noted the influence of Serpico (and other ‘70s crime dramas) on Ridley Scott's American Gangster (2007). Remarkably, Lumet completed the filming, originally scheduled to last 11 weeks, in 10 weeks and one day. The movie emphasizes that when his own superiors refused to listen to Serpico’s charges of dishonesty in the force – and even counseled him to accept the way things were, or possibly wind up “in the river” – Serpico tried to alert the mayor to the problem of police corruption, but was rebuffed through an intermediary, allegedly because of the mayor’s concerns about the need to sustain high morale among NYPD officers who might be needed to sustain a thin blue line of defense during “a long hot summer” rife with potential for rioting. Only after Serpico co-operated with a New York Times expose on police corruption did the mayor appoint the Knapp Commission investigators (Lumet, 1973). Know 21 Myths About Schizophrenia.